The Rijksmuseum in Amsterdam is a must-see art museum if you visit the city. Located at the Museum Square, the Rijksmuseum specializes in 'Dutch Masters', the oil paintings from world-famous Dutch artists like Rembrandt, Vermeer and Jan Steen. Our view? If you have time for only one museum in Amsterdam to visit, make it this one. Due to a massive renovation, only the 400 best pieces of the Rijksmuseum - Rembrandt's 'Night Watch' and comparable famous 17th century paintings - are shown in the Philips Wing of the museum. The rest of the museum is closed until 2013. Another major museum, the Stedelijk Museum of modern art, only runs some temporary exhibitions on various locations in the city. This coincidence is rather unfortunate. But rest assured, even the museum part that's open still consists of 13 large rooms and it's really the absolute highlights that are on display there. Enough to keep you occupied for many hours. The museum still draws over 1 million of visitors each year. What Can You See At The Rijksmuseum in Amsterdam? It's probably hard to imagine now, but during the 17th century, Amsterdam was the hub of the emerging world economy due to the Dutch' dominance on many oceans. At the same time, the arts took a high flight, too. Painters like Rembrandt, Vermeer and Jan Steen are among the world's best during this period. 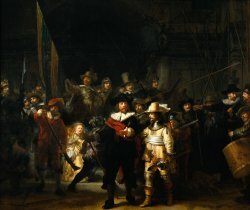 The absolute masterpiece of the Rijksmuseum is the 'Night Watch' (1642), the best-known painting by the leading Dutch painter of all times, Rembrandt van Rijn. Rembrandt (he signed with his first name only) was a master of the use of light and darkness, which created drama and dynamic contrast in his paintings. His portraits show a profound empathy for humans from all walks of life, and in his many self-portraits he surveyed himself without vanity and with the utmost sincerity. The Rijksmuseum has 20 paintings by Rembrandt, among which 'The Night Watch' and 'The Jewish Bride'. Johannes Vermeer, who did not produce many paintings, specialized in exquisite, domestic interior scenes of ordinary life. 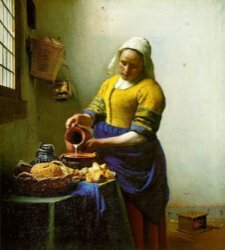 Vermeer used bright colors and the world his pictures show was more perfect than anything he had witnessed. Only in 1866, dozens of paintings were attributed to him, leading to his current reputation as one of the leading Golden Age painters. The Rijksmuseum has 4 of Vermeer's paintings, including 'The Kitchen Maid' and 'The Love Letter', but not 'Girl With A Pearl Earring', which hangs in The Hague (which is, by the way, just one hour by train from Amsterdam). Other famous paintings on display include 'The Merry Drinker' by Frans Hals, 'Woman With A Child In A Pantry' by Pieter de Hooch and 'Portrait Of Elizabeth Bas' by Ferdinand Bol. Next to paintings, furniture, delftware and silverware from the 17th century are shown. 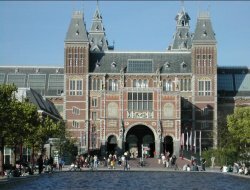 The Rijksmuseum building itself is also noteworthy - a creation of famous architect Cuypers, who also built the Central Station. During the renovations, the Rijksmuseum in Amsterdam has temporary exhibitions at other Amsterdam locations (such as the Nieuwe Kerk). The museum also has a permanent branch on Amsterdam Airport Schiphol (behind the passport check point, between the E and F pier) which is freely accessible. The Rijksmuseum in Amsterdam located at Stadhouderskade 42. However, the entrance of the Philips Wing is at the other (southern) side of the building. Public transport: Tram 2 and 5 go there (stop Hobbemastraat) as well as tram 12 (stop Concertgebouw) or tram 6, 7 and 10 (stop Spiegelgracht). Better leave your car at home, but if you must, there are limited parking possibilities in the vicinity, including a parking garage. 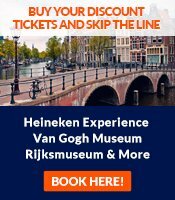 For opening hours and ticket prices, visit www.rijksmuseum.nl. You can also buy tickets online there, so you don't have to wait in line. And lines can be long, so either show up early, or buy a ticket online. Alternatively, the Iamsterdam Card and the Museumkaart both give free access to the museum, but you'll still have to wait in line. The Rijksmuseum of Amsterdam does not have a restaurant or café, but at Café Cobra at the Museum Square outside the Rijksmuseum, you will receive a 15% discount upon showing your museum ticket. If you're interested in Rembrandt, you can also visit the Amsterdam house he lived in for almost 20 years, during his affluent period. Rembrandt was successful, but always lived above his means. He collected art, weapons, and exotic objects from places far away. Many of them are on display in the Rembrandt House, which has been kept in the original state as much as possible. It's a wonderful insight into daily life in the Golden Age in Amsterdam. Eleven years before his death, he was declared bankrupt and had to give up the house. The house is located at the Jodenbreestraat, a few kilometers from the Rijksmuseum. For opening hours and ticket prices, go to www.rembrandthuis.nl.